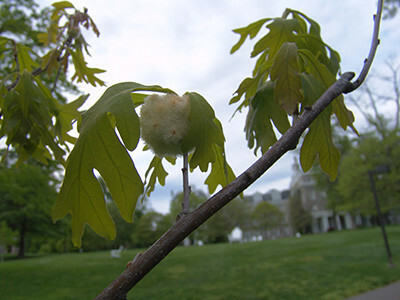 Some of the newly installed oaks on campus appear to have grown cotton balls with pink spots. These are actually a type of tree gall called Wool-sower gall. This gall is produced by the harmless Cynipid gall wasp (Callirhytis seminator). These wasps lay their eggs on a specific plant and the eggs produce the grubs whose secretions cause the gall formation. The gall provides protection and nutrition. Their favorite host plants are oaks. The galls do not harm the tree, so the best integrated pest management practice is to co-exist. One-to three-weeks later a wasp will emerge. It is another amazing insect-plant relationship. Have never seen these before, very interesting, Have to keep our pollinators reproducing! I am really enjoying these posts, so informative, and the plants are beautiful! Thank you Wendy. There are some really interesting insects out there! I am always amazed how much we still don’t know about the natural world. For instance, I could find little to no info of the adult habits of this creature.